How to perform all types of testing activities? When to execute, what type of test, at what of moment of time? Who will be performing testing at what particular stage? The solution to all these sorts of questions with respect to agile testing may be explored through the concept of agile testing quadrants. What are Agile Testing Quadrants? Agile testing quadrants may be considered as a tool or a manual outlined by the Brain Marick, which divides the whole agile testing methodology into four quadrants for arranging the testing types to be performed at each different level to suite the agile manifesto. However, the participation of the developers in the Q1 does not restrict the entry and work of a tester. A tester may go through the documentation work to have a better understanding of the internal structure of the software product which may help in designing, effective test cases. In the second quadrant, we may see the business driven test cases are being implemented for supporting the team. Basically, the main focus of this quadrant is the business requirements. Generally, it involves the usage of both manual and automated testing and consists of testing types such as functional testing, story tests, prototypes & simulations, pair testing done at the system level. A tester continuously interacts with the client or the stakeholders to gather and implement the evolved requirements in the test cases. In the third quadrant, feedbacks and reviews of previous testing phase or quadrants along with the real user experience, work as a driving force to test the software product, using multiple scenarios. Manual testing method is being used to evaluate the software application based on the user requirements and logical thinking of a tester. This quadrant is used to build and gain confidence in the usability of the product. The testing types covered under this quadrant are exploratory testing, usability testing, user acceptance testing, alpha & beta testing. This quadrant involves the usage of the technology i.e. tools, to automate the process of evaluating the software product at an operational acceptance level to fulfil the non-functional requirements, such as reliability, security, compatibility, maintainability, interoperability, recovery, etc. 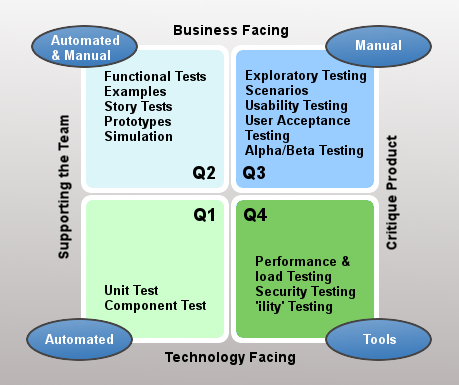 The testing types covered under this quadrant consist of performance testing, load testing, stress testing, maintainability testing, security testing, reliability testing, recovery testing and other types of testing, used to verify and validate the non-functional requirement of the software product. Some of the commonly used tools in the Q4 are Jconsole, Loadrunner, JMeter, etc. Note: It is pertinent to mention that there is no hard and fast rule, to follow the quadrants in a sequential manner as explained above. A tester may start from any of the quadrant as per the requirements, priority, risks involved, and its own choice.